The seemingly disparate duo of Sony’s Venom and Warner Bros.’ A Star Is Born actually have far more in common than you’d think—they both came out last Friday, Oct. 5, they’ve both been described as romances, and they share a director of photography (! )—but their clearest commonality is their popularity with audiences. The two films blew box-office expectations away to the tune of some $122 million, propelling this past weekend’s total take to an approximate $172 million. That’s good for the biggest October box office weekend of all time, per Box Office Mojo. Venom was a record breaker right out of the gate, topping the October record for preview earnings last Thursday, Oct. 4, ahead of its wide release the next day. The Ruben Fleischer-directed, Tom Hardy-starring Marvel antihero film made an estimated $80 million in its opening weekend, shattering another record with the biggest October opening weekend of all time by surpassing the $55.7 million mark set by Gravity in 2013. That’s Star Wars territory, folks: Although Solo: A Star Wars Story was deemed a box-office flop relative to the rest of that money-printing franchise, it opened to $84.4 million domestic, meaning Eddie Brock spent his weekend nipping at Han’s heels. And that’s not all: Venom raked in $125.2 million overseas, setting yet another October opening record with $205 million worldwide. Even in light of the film’s $100 million production budget and “tens of millions of dollars in marketing costs” (per The NYT), this haul practically guarantees that the Venom sequel, which Woody Harrelson had already all but confirmed, will indeed see the light of day, bad reviews be damned. A Star Is Born , on the other hand, has earned rave reviews and Oscar buzz all over the place, making its box office success significantly less unexpected. Bradley Cooper’s directorial debut, in which he stars alongside Lady Gaga and Sam Elliott, opened to an impressive $42.6 million, landing among the top 10 October opening weekend totals of all time. To put that in perspective, a similarly acclaimed, music-centric romantic drama of this stripe, Damien Chazelle’s 2016 Oscar winner La La Land, made just $9.2 million in its opening weekend. A Star Is Born has already made back its $36 million production budget, and will likely keep a stranglehold on box-office earnings, as it’s a virtual lock for a handful of Oscars come awards season. That’s all to say we’ll certainly be getting another look at Cooper in the director’s chair, and at Lady Gaga in the Hollywood spotlight. 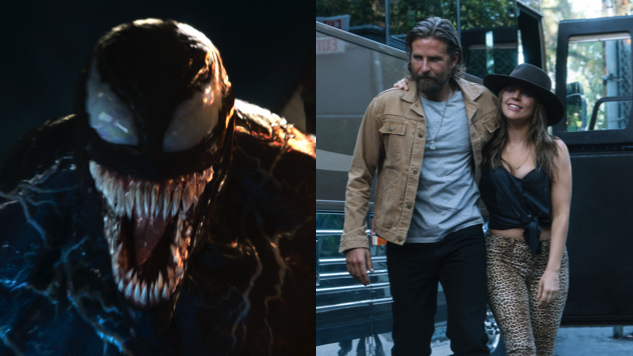 All told, the dynamic duo of Venom and A Star Is Born—with a little help from Smallfoot, Night School and The House with a Clock in Its Walls, among others—pushed this weekend’s box-office total to the top of the record books, exceeding October 2014’s first weekend by over $25 million. Celebrate with one of the countless A Star Is Born memes littering the internet—bonus: this one includes Venom!—below.